The First Judicial District Commission on Judicial Performance unanimously recommends that Judge Randall C. Arp BE RETAINED. 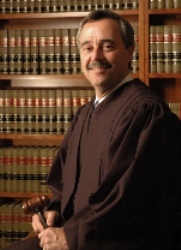 Judge Arp was appointed to the First Judicial District Court in July of 2006. This is Judge Arp’s second performance review since his appointment to the bench. Prior to his appointment, Judge Arp was engaged in private practice with the law firm of Bradley, Devitt and Arp, PC. His practice was primarily in the areas of family law, bankruptcy and a small amount of criminal defense. He earned his undergraduate degree from Moorhead State University in Minnesota and his J.D. from the University of Colorado School of Law. Judge Arp is involved in a variety of community service activities including the High School Mock Trial competition, the Access to Justice Committee, and the Supreme Court Standing Committee on Family Issues. Survey results among attorneys consistently rank Judge Arp above average in areas of diligence, communication, case management, and demeanor. Although some feel he shows bias in favor of the prosecution and can be inconsistent in sentencing, 79% of attorneys responding to the survey recommended that Judge Arp be retained (as compared to 80% for all district judges evaluated during this retention cycle), 12% not to retain, and 10% made no recommendation regarding retention. Judge Arp scored slightly below average among non-attorneys, yet 90% of those responding to the survey recommended retention (as compared to 88% for all district judges evaluated during this retention cycle), 7% not to retain, and 3% made no recommendation regarding retention. Judge Arp is generally described as professional, considerate, and well-reasoned by district attorneys and public defenders alike. He has also demonstrated an ability to adapt to transition within the court system. In his personal interview and self-evaluation, Judge Arp expressed a willingness to identify and address areas in which he can improve and believes that his 6 years of experience on the bench has made him a better judge. Based on these findings, the Commission unanimously recommends that Judge Arp BE RETAINED.